As anticipated, the rough patch in the coincident indicators has resolved to the postive, but there has been a little more deterioration among the long leading indicators. Manufacturing jobs rose by 31,000 for an average of 18,700/month in the past year vs. the last seven years of Obama's presidency in which an average of 10,300 manufacturing jobs were added each month. December was revised upward by 15,000. January was also revised upward by 39,000, for a net change of +54,000. the average manufacturing workweek rose 0.2 hours from 40.8 hours to 41.0 hours (reversing last month's decline). This is one of the 10 components of the LEI. construction jobs increased by 61,000. YoY construction jobs are up +254,000. temporary jobs increased by 26,500.
the number of people unemployed for 5 weeks or less increased by 228,000 from 2,280,000 to 2,508,000. The post-recession low was set over two years ago at 2,095,000. Overtime rose from 3.5 to 3.6 hours. Professional and business employment (generally higher- paying jobs) increased by 50,000 and is up +495,000 YoY. the index of aggregate hours worked in the economy rose by 0.9%. the index of aggregate payrolls rose by 0.6% . the alternate jobs number contained in the more volatile household survey increased by 785,000 jobs. This represents an increase of 1,924,000 jobs YoY vs. 2,281,000 in the establishment survey. Government jobs rose by 28,000.
the overall employment to population ratio for all ages 16 and up rose 0.3% to 60.4 m/m and is up 0.4% YoY. This was a a blowout positive report as to nearly all metrics. All important categories of employment rose strongly, as well as aggregate hours and aggregate payrolls, the employment to population ratio and the labor force participation rate. Among prime age workers, the e/p ratio is now only -0.9% under its 2006 high, although it is still about 2% under its all time high from 1999. Even the "soft" data of the unemployment and underemployment rates is largely explained by the surge in labor force participation -- i.e., more people entering the jobs market to find work. Negatives remain the persistently high number of people who are not even in the labor force but say they want a job now, and the increase in involuntary part-time employment. Wage growth for ordinary workers remains little better than flaccid, up 2.5% YoY this month. Last month's much ballyhooed 2.9% YoY increase for all workers fell back to a 2.6% rate. In the past, a surge in labor force participation has meant a short-term deceleration in wage growth . So in sum this was an excellent report. But it does nothing to assuage my longer term concern about what will happen to wages in the next recession. Today marks 16 months since the 2016 election, and 32 months before the one in 2020. We are one third of the way through. Barring a major industrial or nuclear war, we are going to make it. The only major legislative accomplishment so far is the pro-cyclical, lopsided tax cut giveaway to corporations and the wealthy. Additionally a bunch of lifetime judicial appointments have been made. On the executive side, there have been a slew of directives, and a bunch of regulatory backsliding, chiefly at the EPA, and net neutrality. In 2021, the executive directives can be quickly undone. New federal court judgeships at the lower levels can be established equal in number to those appointed by the current executive. Anthony Kennedy. bless his soul, looks like he is not retiring. The tax cuts can be reversed using the same reconciliation process as was used to establish them (and the booty clawed back). New regulators can restore what was lost. And the blue tsunami of voters born since 1974 will building higher and higher as the red wave recedes one funeral at a time. Deep breaths. We will get there. Friday is nonfarm payrolls day, so in the absence of more noteworthy economic news, let me follow up on Monday's post in which I discussed "A simple model of interest rates and the jobs market." 2. the YoY change in the Fed funds rate also does a very good job forecasting the *rate* of YoY change in payrolls 12 to 24 months out. I suspect that in a low interest rate environment, more modest increases in interest rates might have a more pronounced effect. For example, an increase in mortgage rates from 2% to 4% doubles the monthly interest payments on a mortgage (i.e., a 100% increase), whereas an increase from 8% to 10% only increase it by 25%. Note that there are 3 significant false positives that occur when there have been two interest rate cycles during an expansion. I only get resonable numbers by re-setting the low in interest rates during those cycles. And since the YoY change in payrolls is a good mid-cycle indicator, by insisting that the intersection occur while YoY payroll growth is declining, I'm already conceding that it must occur later in an expansion. Finally, there is still the problem of 1933-55, during which time interest rates barely budged. So unfortunately it seems that this metric is of limited value. It does have some merit as a "yellow light," strongly cautioning that there is a heightened probability of a recession is within 18 months, with the "red light" suggesting the near certainty of a recession within 12 months only if/when the YoY increase in interest rates exceeds the (decelerating) YoY% growth in jobs. It also does seem to suggest something about the depth of the subsequent recessions, as the two "worst" values generated by the metric occur in advance of the 1982 and 2007 deep recessions. By this metric, we are on the verge of activating the "yellow light." The yield curve never inverted between the early 1930s and the mid 1950s. And yet there were four recessions during that time. For that reason I am very leery of over-reliance on that metric as a necessary component of recession forecasting. In particular, the biggest inflation that occurred ever since 1920 happened in 1947-48 -- an even bigger event than in the 1970s. The Fed pretty much sat on its hands. And yet there was a recession. What would a case study of the 1948 recession show? I take a look over at XE.com. 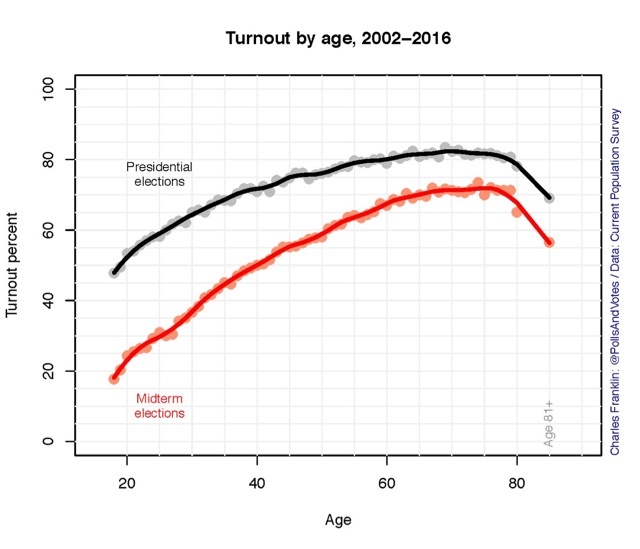 Below is a graph showing that the older the demographic (up until age 80), the bigger the turnout during midterm elections. The data behind this graph isn't just from 2014, but from a series of midterm elections over time -- in other words, it has been durable over time. My purpose in this post is show that, even if these percentages hold in this year's midterms, the electorate is going to skew considerably less "red" than it did in either 2010 or 2014. Unfortunately, while dividing age cohorts into only four may make for a clean graph, it paints with far too broad a brush, and has led to some misguided generational bashing online. So let's take a more granular look. There is lots of evidence that most people form their bedrock political outlook in their late teens. Basically, if at age 18 or so, there is peace and prosperity, you are likely to embrace the ideology of the party of the President. Conversely, if the economy is performing poorly or there is social upheaval, you are likely to embrace the ideology of the opposition. 1. political leanings are durable over lifetimes, i.e., people don't inevitably become more conservative as they age. 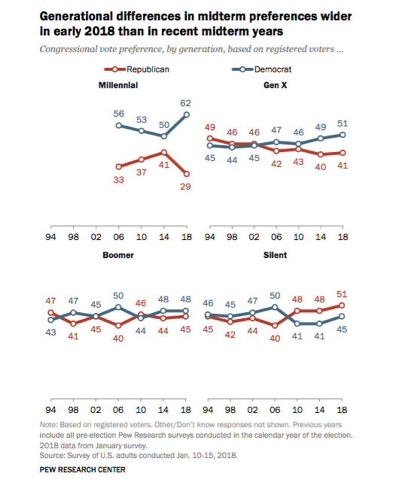 2. the outsized conservatism of the age 60-80 cohort most likely to vote in midterms is a happenstance of the last decade or so, and will have faded significantly by election day this year. Quick, which is the most liberal demographic? Obviously, it's the Greatest Generation, isn't it? They remained durably Democratic until they passed away (even now there are still about 2 million alive). So much for turning more conservative with age! Next, comparing the first four elections with the four most recent elections (3 vs. 3 in the case of the Clinton cohort), only 4 demographic groups become more conservative over time: Truman, Eisenhower, Kennedy/Johnson, and Reagan/Bush. 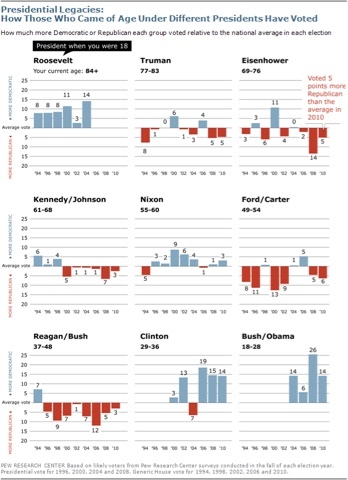 Three -- Nixon, Ford/Carter, and Clinton -- have voted more Democratic over time. 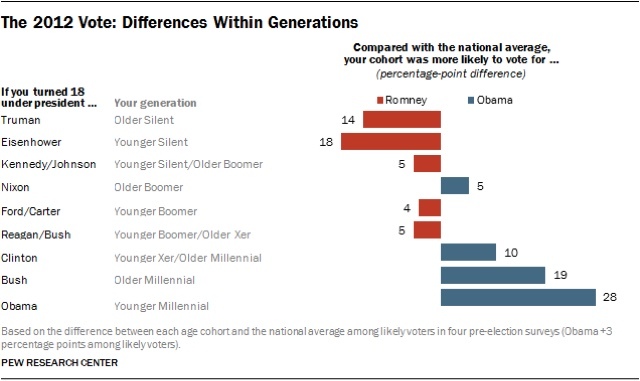 With no other information at all, the fact that the deep blue Greatest generation passed from the scene after 2006, and were replaced with more conservative cohorts in the age 60-80 group that votes most heavily in midterms, suggested that those two elections would skew more deeply "red" than any other recent elections. This year all the Truman cohort and the first 1/4 of the Eisenhower cohort are over age 80, when presumably frail health causing voting participation in midterms to decline precipitously, and have been replaced in the most heavily voting bloc by the "blue" Nixon cohort. Meanwhile the blue Clinton cohort is moving past age 40 and can be expected to vote in greater numbers, at a rate roughly equal to that of the Truman and Eisenhower cohorts. 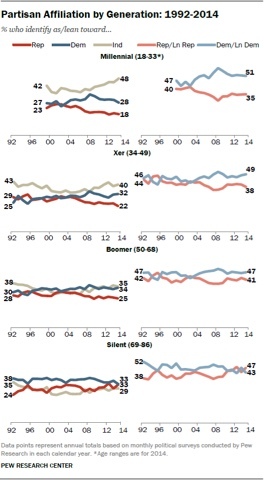 That alone should shift the demographics of this year's midterm electorate more bluish. There is a very consistent die-off in each birth-year's population of about 100,000 per year beginning in their late 50s. 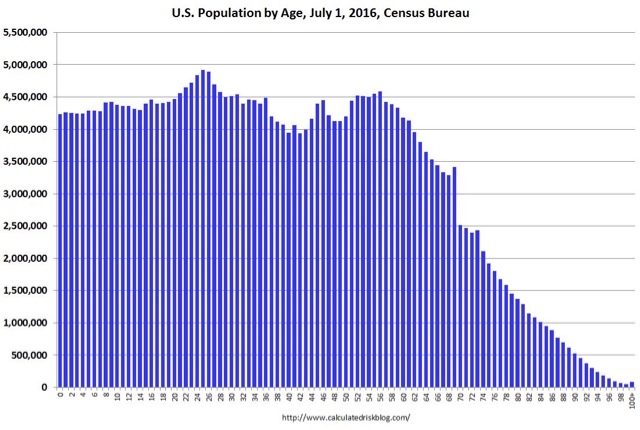 That means that in the last four years, roughly 3.2 million of the "red" 8 million Truman cohort and another 3.2 million of the "red" 12 million Eisenhower cohort who were alive in 2014 have passed away. Put this all together and the basic fact is that the 2018 voting population is going to be considerably more liberal and Democratic than the 2014 population, even if Millennials turn out only in percentages consistent with younger voters in other midterm elections. 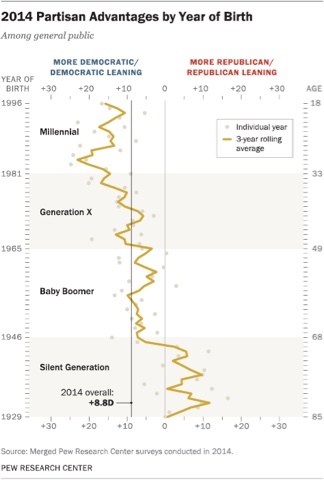 Take a look at what happened with Millennials, because it is unlike what happened with any other age group. After surging towards the Democratic party in 2008, they deserted the party in droves over the next 6 years, turning into independents instead. The sour implication is very clear: Obama broke their hearts. After promising "Hope and Change," aside from healthcare (not their core issue!) he mainly delivered a nip and tuck around the edges of the neoliberal consensus. In order for Millennials to turn their ideological choices into reality, they are going to have to take a few centrist Democratic scalps.